Richard John Philip Hewetson, was the only son of the Reverend William and Susan Kathleen Hewetson (nee Burgess). He was born on 14th August 1893 in Aston Pinxton, Warwickshire, and moved to Thame in 1898 when his father was appointed vicar at St Mary’s church. They lived in the vicarage on the Long Crendon Road until 1905 when they moved to Salhouse, Norfolk. Richard was educated at The Knoll, Woburn Sands and Dulwich Preparatory Schools, afterwards at Repton School and Oriel College, Oxford. out in no man’s land for nine hours. He was returned to England and lost the use of his fingers for some months. During this time at home he acted as assistant adjutant of the 3rd (Reserve) Battalion before going back to France in March 1917. 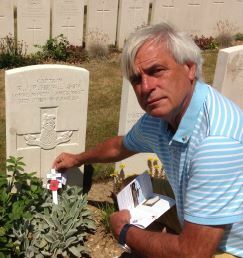 This time he joined the 9th Battalion and was adjutant until the Battle of Messines, when he acted as liaison officer between a Canadian brigade and his own. After this he became adjutant and quartermaster for the 2nd Corps Advanced Reinforcement Camp, and later took part in the engagements around Ypres, Westhock, etc. He went back to England in October and was advised to accept home service, as his heart was overstrained. He requested, however, to be passed fit for general service again, and although unfit, he was sent once more to France in April, 1918. 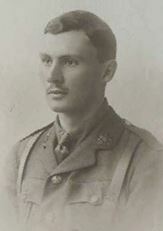 He rejoined the 9th Battalion, but was given command of a brigade instructional platoon because of his “splendid work the year before in heartening up men”. His division, the 25th, was sent with other tired divisions to rest on the Aisne where they were overwhelmed on May 27th by five times as many Germans. He was ordered to fill a gap which had occurred on the left flank three miles long. This was over five miles away. They had not gone more than half an hour when they met with the enemy in large forces. They put up a fight which lasted nearly one hour, by which time they were practically surrounded. Captain Hewetson was taken prisoner with his leg smashed, but was not picked up by the Germans until the next day, by which time gas gangrene had set in. His leg was amputated by an English doctor who was also a prisoner, but, owing to dysentery and pneumonia, Captain Hewetson died five weeks later, on 3rd July 1918, in a cellar converted into a field ambulance. He was 24 years of age and was buried by the Germans in Beaurieux French Military Cemetery.